D'ya wanna bet? Will TfL's "Western Curve" plans get planning approval? 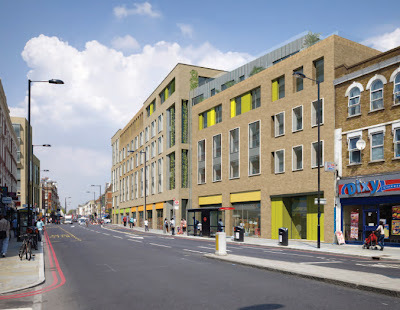 On Wednesday 3rd July Hackney's Planning Committee will consider TfL's application to build 106 flats and shops on Dalston's 'Western Curve'. 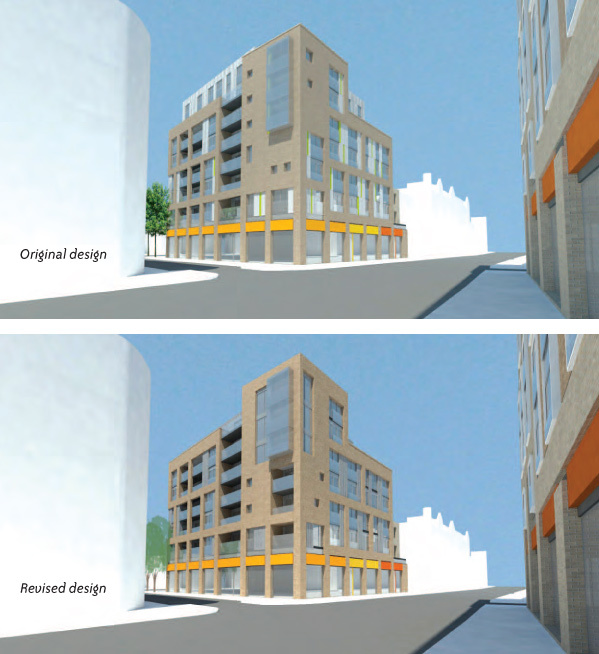 Will the Committee agree with Hackney officers' recommendations or with the objectors? - it provides "a well defined distinction between the public realm and the private space behind the main building facades"
- "the level of affordable housing proposed is the maximum amount that can be reasonably achieved on the site"
- "the sites are not suitable for provision of open space"
- "reduces its mass at sensitive locations to create a more responsive and sculpted form" and causes "no substantial harm to heritage significance"
- the designs are bland, undistinguished and will dominate the High Street and its historic buildings. - the overshadowing of the Grade II listed building, as TfL's consultant's say, is "Substantially Adverse"
You can read OPEN Dalston's objections here. You can see the TfL's planning application documents here. You can read Hackney's report to its Planning Committee here. Speak up before its too late! Plans for a Gated Community in Dalston are up for decision. This is your last chance to comment on plans to build a gated community on Dalston's Western Curve. The Transport for London/Taylor Wimpey plan is expected to be decided by the Hackney Plannning Committee on Wednesday 3rd July. You can read OPEN Dalston's objections here. You can see the TfL planning application documents here. We urge you to let Hackney know you views here. - The two sites, northern and southern, front Kingsland High Street in Dalston above TfLs Western Curve rail link from Dalston to Canonbury. - All of TfL's public land will be privatised by enclosure within the sites, with no open or green space accessible there to the public- . Dalston is one of the most densely populated wards, and one of the most deficient in green space, in London. - Of 106 'units' to be built on the two sites there will only be 9 flats for social rent. There are some 9,000 overcrowded families with children living in Hackney. - The developers are trying to maximise their returns by overscale buildings - at the permanent expense of our local environment. The buildings exceed the heights prescribed by the government approved Dalston Area Action Plan. The new blocks will loom over the surrounding buildings. - TfL will be providing no play space for children living in the new development or locally. - TfL's own consultant's report states that the design of the northern block is such that overshadowing will be "Substantially Adverse" for listed and locally listed buildings. 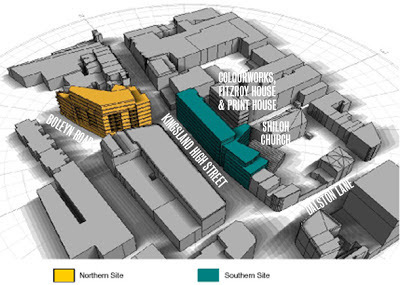 - The southern block will enclose Ashwin Street and conceal views of the recently restored Reeves and Son building and the Shiloh Church. - Ashwin Street will become a "shared space" for pedestrians and HGV delivery vehicles ( to do three point turns). The pavement cafe will be overshadowed. - Hackney has contributed over £1million to strenthen the tunnels to support taller buildings. Hackney and TfL have both ignored OPEN's Freedom of Information requests for details of their deal. Let Hackney know you views. Do it NOW here. TfL have a history - look at The Slab and Dalston Square. Hackney has been advised to sell Dalston's Peace Mural building on a 15 year lease to a private developer who is converting 17-19 Dalston Lane next door into a bar and restaurant, a report to Hackney Council's Cabinet reveals. The report states that "the building as a whole is in a very poor state structurally and this will, if not repaired, eventually necessitate demolition. 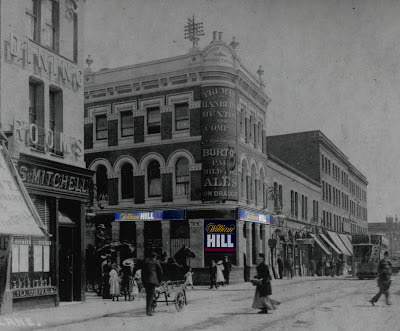 A lease to a commercial operator will enable the Council to repair the building and secure the future of the mural at no cost to the public purse and provide an income.". 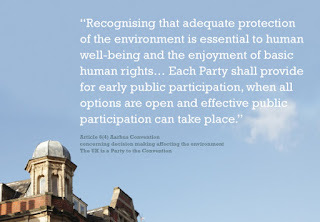 The Council report acknowledges that there has been no consultation on the proposal to dispose of it. 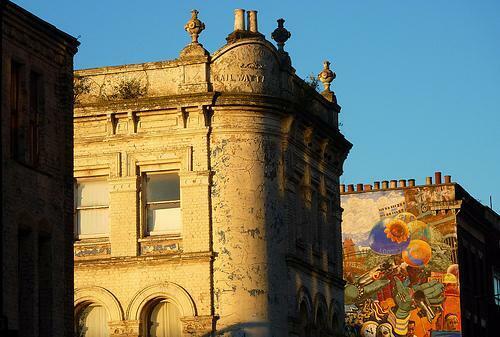 The Dalston Peace Mural is an iconic cultural landmark and part of a building which Hackney has allowed to become derelict.The structural repairs may include rebuilding the front and rear walls, during which the side wall with the mural could be potentially vunerable and in a precarious state. It seems extraordinary that, without consultation or marketing, Hackney should agree to sell it to a new venture with no apparent trading history, which is associated with Antic Ltd. which recently collapsed reportedly owing £2.6million, which has twice been refused planning permission to develop the neighbouring site, and which has no known record of building conservation.